Everybody loves food and I love it even more when I am cycling all day long, day after day. 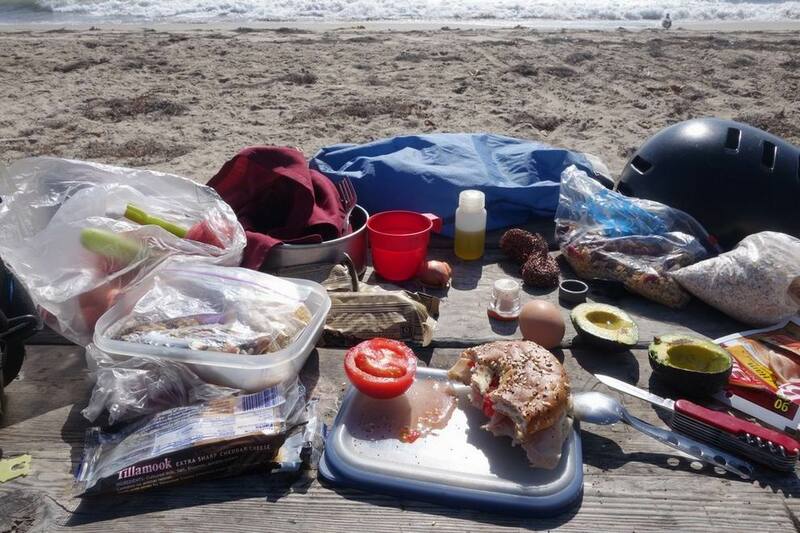 Like any cyclist on tour, I wake up thinking about breakfast, I climb the hills and cross the valleys thinking about the next lunch break, I pitch my tent as fast as possible, looking forward to start preparing dinner. 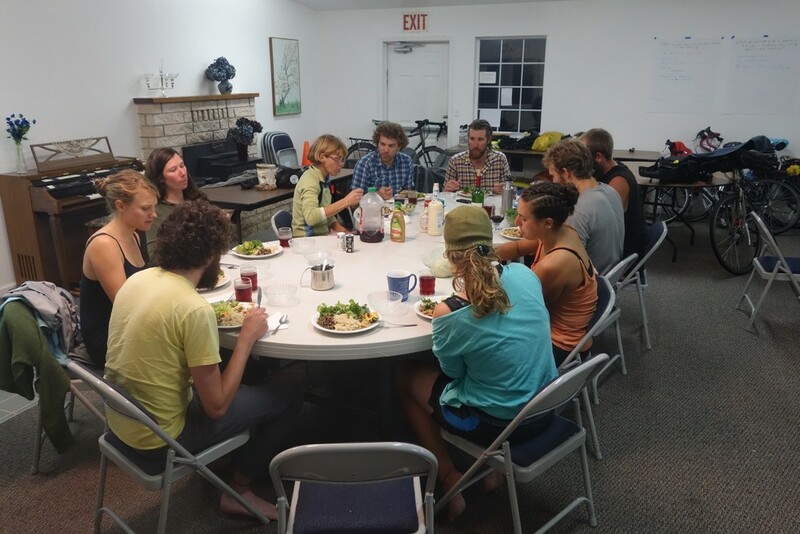 One of the big pleasures of bike touring is to have the guilt free desire and ability to eat twice as much. 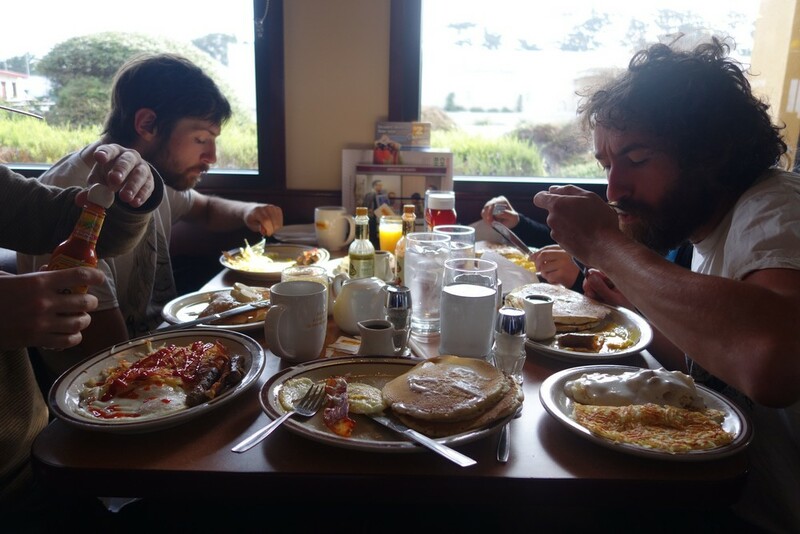 In fact food is usually the majority of the expenses while on the road, as food is the actual fuel that makes those legs move. You also get to appreciate the luxury and importance of a warm plate at the end of the day. 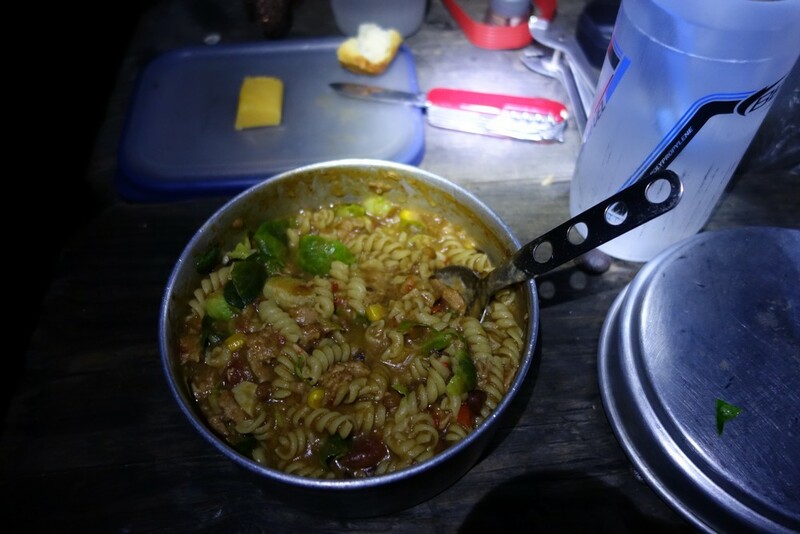 After spending an entire day outdoors in any kind of weather, or while trying to keep warm during the common evening chill, a hot meal is like heavens in your stomach. But what does someone eat while on a tour? Eating out everyday can be expensive for long trips and restaurants are rarely available when really needed in remote areas. The solution is to pack various supplies, cook them and consume them when needed. 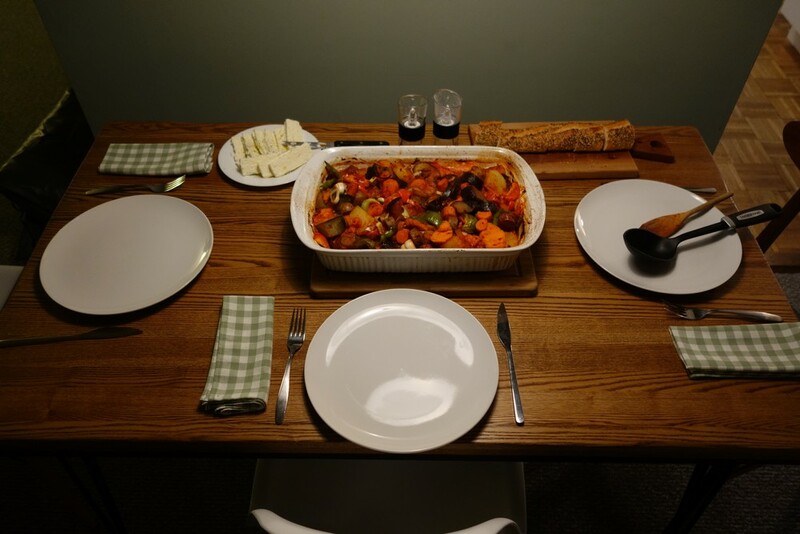 The options are somewhat limited due to weight, refrigiration and kitchenware, so I was always interested to find out what others are eating to expand my menu. 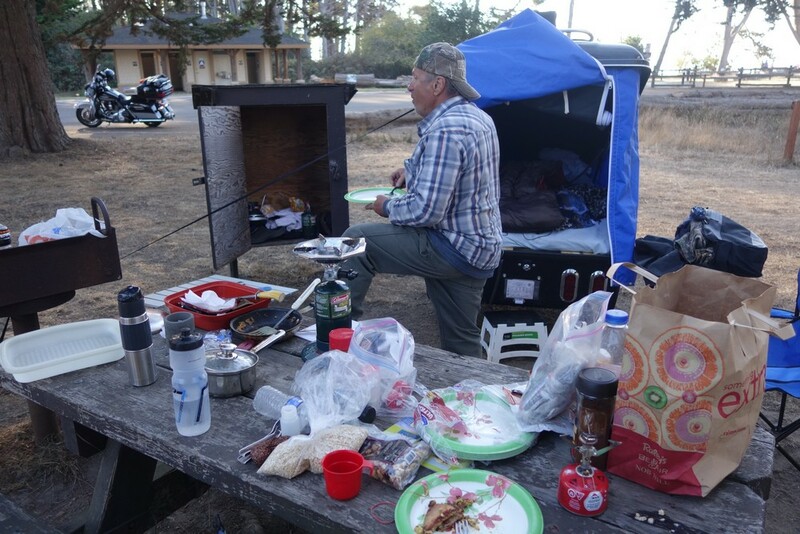 The inventory of my mobile kitchen included a gas stove, a small pot with its lid doubling as a pan, cutlery, a tapperware to store sensitive food and use its lid for cutting board. I always carry salt, pepper and a bit of olive oil which I would steal from refill in restaurants and hostels. 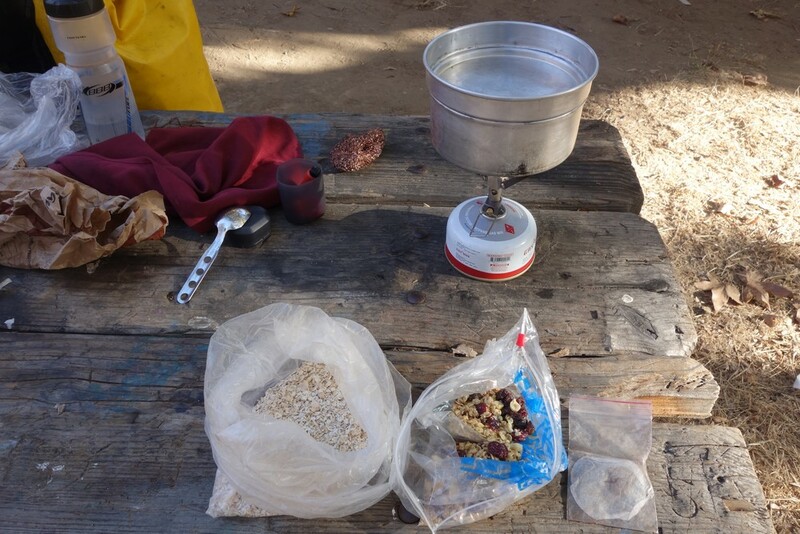 The single pot and stove create a logistic issue with how many things can be prepared at once and at which order, but various solutions were found to create an all in one pot meal. By far my favorite option was instant oatmeal. It usually comes in one portion paper sacks and all it needs is hot water. Unfortunately one portion is usually not enough, so I was either using two, or buying it in bulk whenever it was available. I didn’t mind eating it on its own, but by adding some nuts or fresh fruit in the pot, the breakfast became a morning celebration. I don’t really need tea or coffee to start my day, but very often I would have a cup of English tea to warm up after a cold night. I would never turned down coffee when it was offered to me. 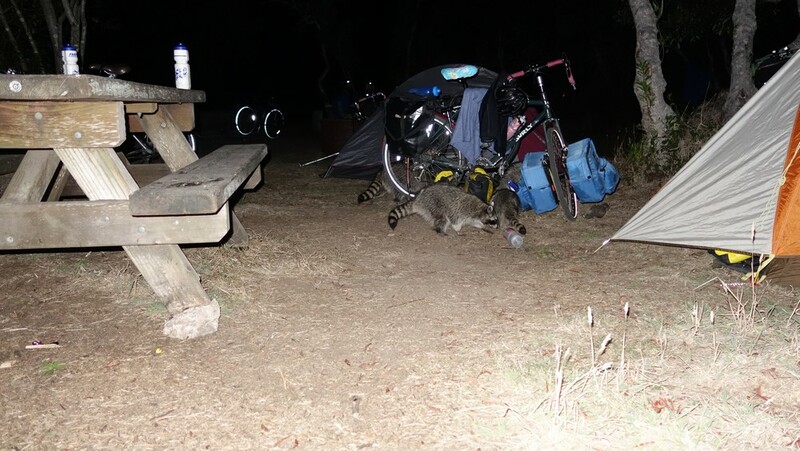 It’s always good to be friendly and open with other people in the campsite and sometimes you find good people that will offer some of their breakfast. 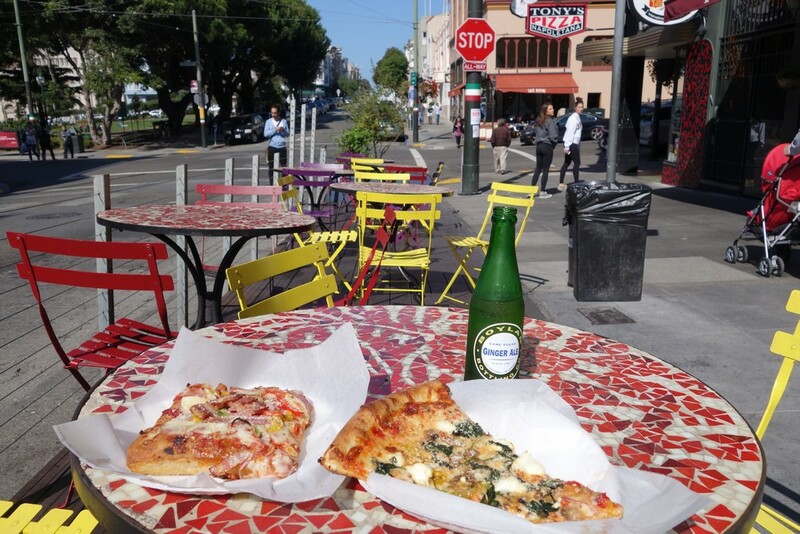 Easy rider – easy breakfast! 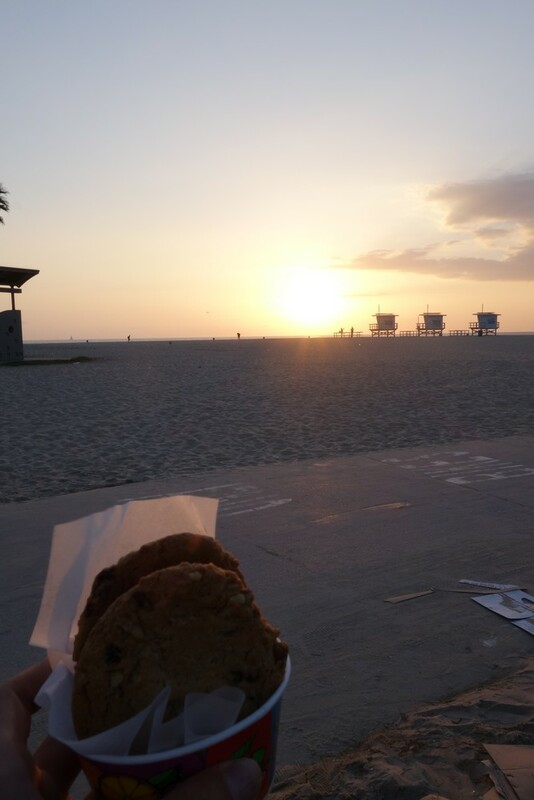 Other people were carrying bagels, jam and peanut butter. Put all these together for the famous and surprisingly tasty peanut butter – jelly combo! 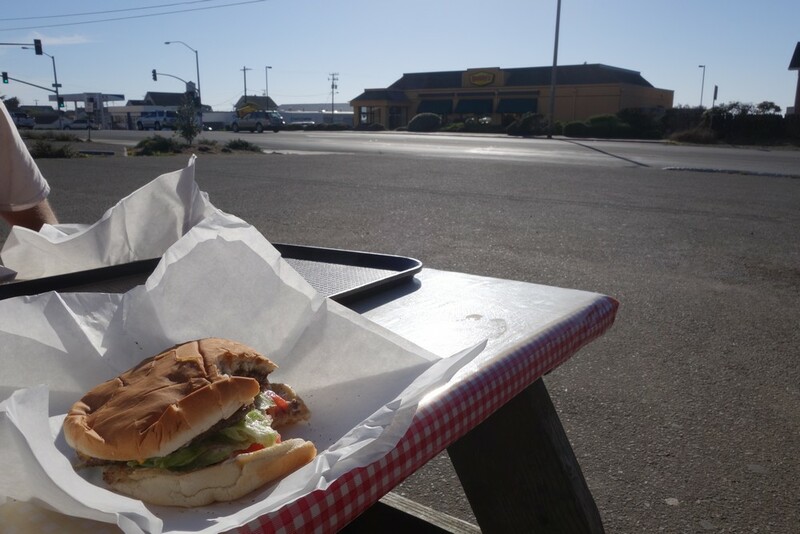 By the time I was on the road, I was usually hungry again. I would either have a snack, a fruit or if a bakery was on the way I would stop for a pastry. A couple of times with other cyclists we would stop at a dinner for a fry up breakfast of eggs, greasy bacon or sausage and pancakes. I always had various type of snacks on me at any time. 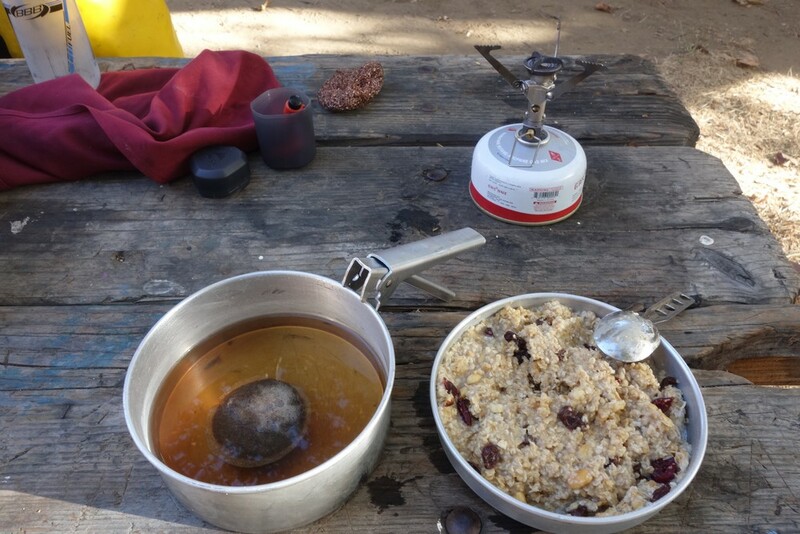 Granola, nuts and various other energy bars was always a convenient solution. Trail mix nuts is by far the best snack, but just a little too pricey regarding how fast they can be consumed. 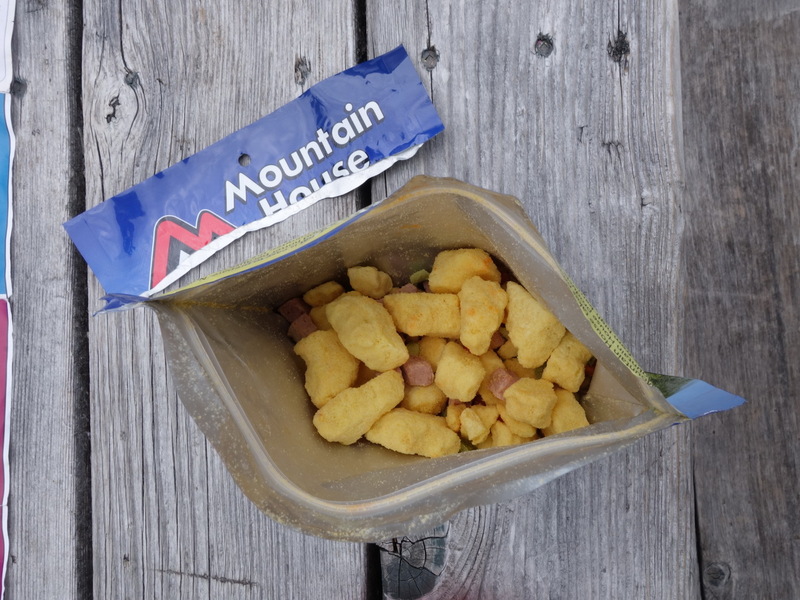 My favorite mix was a combination of peanuts, almonds, raisins and wasabi nuts. 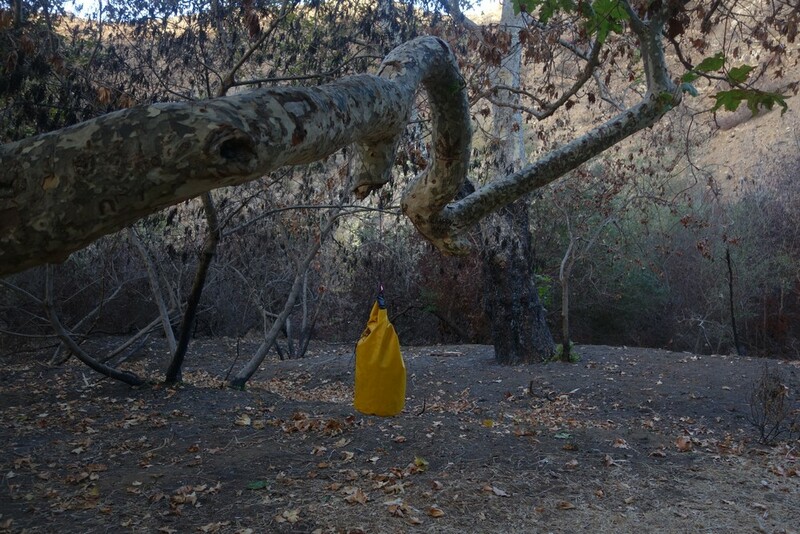 I was always trying to carry a few fresh fruits and vegetables with me. 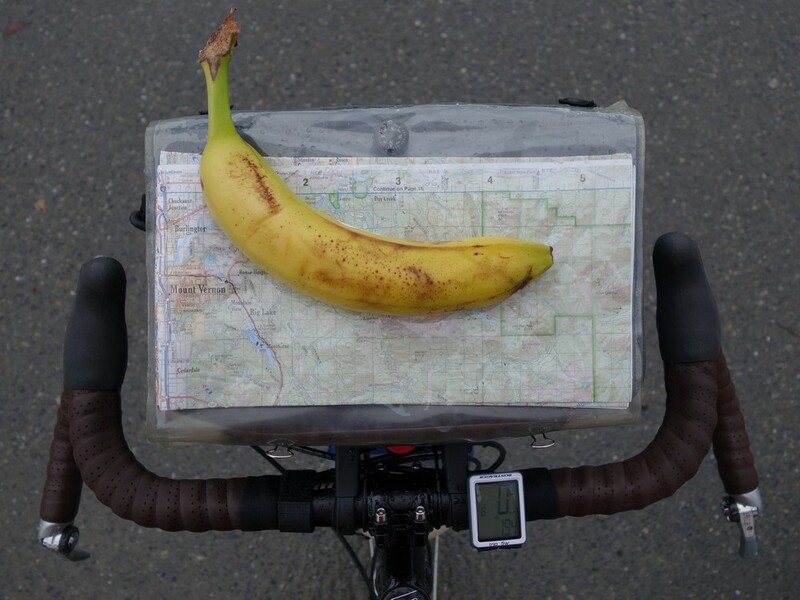 Banana is the king of all cycling food, as it is reach in sugars and comes in its own convenient packaging, which can be pealled and eaten with one hand while riding. Another gem is carrots. I would buy a bunch of them at a time and consume them on the road or together with lunch and dinner. They are easy to carry, they last several days, they fill the stomach pretty well and apparently they are good for the skin’s sun protection. A latest addition to the snack menu was celery, with plenty of fibers for a balanced diet. I never cooked a proper meal for lunch, as I didn’t want to waste much of the day light, so I was always relying on quicker options. The most convenient option was to buy a cold sandwich from a deli during the morning, find a nice spot and have it there for lunch. If the area was fairly remote, I would get picnic supplies for the next few days. Bagels with enough preservatives can last for 5 days. They can be compressed to take less space and they can be combined with many types of ingredients for a good sandwich. Cheese was almost always present in my food container, even if it can’t last more than 3-4 days outside the fridge. 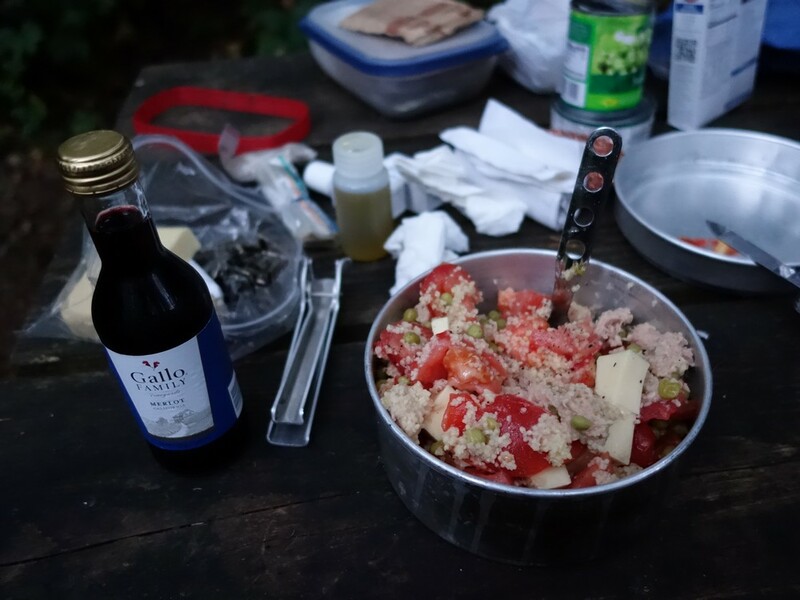 It was consumed in my picnic lunches but also as a side for my dinner. 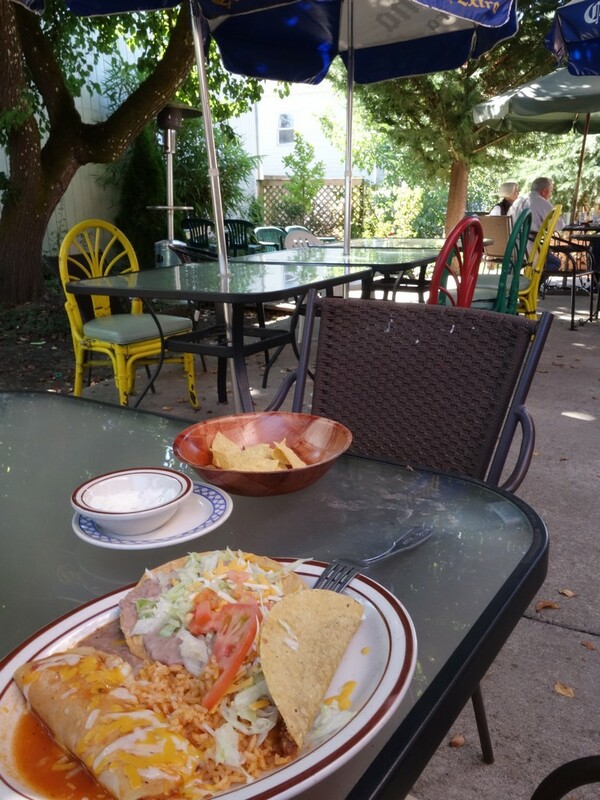 My choice of preference was the inexpensive and local Tillamook extra sharp cheddar cheese. Avocado was also a latest addition to my menu. It lasts several days due to its hard skin, it is easy to carry and very nutritious. Add some olive oil, salt and pepper and it becomes a delicious snack. Boiled eggs was suggested by a couple of other campers and it is indeed a very convenient source of protein. I would boil half a dozen of them at once and slowly consume them through out the week. Salami was also a nice treat. I would get it mostly for my sandwich and if there were any left overs, I would add it to the dinner menu. Fresh tomatoes, because you a sandwich doesn’t deserve to be called one if it doesn’t have tomatoes in it. Unless if I was in a city and I was craving a nice meal and a beer, I would mostly end up cooking my own. Here are a few recipes/contraptions. Probable the simplest meal to prepare, as instant noodles are very quick to boil. I never liked the sauce they come with, so I would just use the noodles and combine them with a ready to eat pasta sauce. A portion of tuna was sometimes added for extra goodness and calories. In fact tuna was used a lot, as it can be combined with almost anything. Only towards the end of the trip I realized they also come in plastic sacks, which are easier and lighter to carry than the classic tins. If available, a piece of cheese was always a good match. An equally easy and fast meal to prepare. I would get a ready to eat soup of various ingredients, preferable in a carton and not tin as it’s easier and lighter to carry. I was in favor of soups with lentils and beans which are a good source of protein and fibers. I would heat it up on the stove with some extra water and boil the pasta directly into it. I would always buy the fastest to cook past to save time and gas. If I had any, I would add some extra fresh vegetables, or start the whole thing by sauteing fresh garlic in olive oil before the soup would go into the pot. Cheese is definitely a good match for this meal. 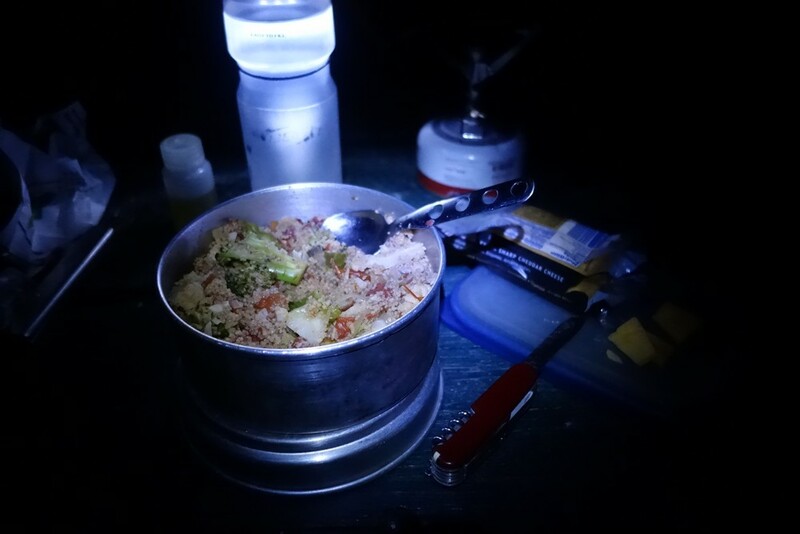 If I was able to buy enough fresh vegetables before getting into the campsite, I would choose to do a vegetable stir fry. I would start with sauteing garlic and onion (shallots as they are good size for one portion) and then slowly add various vegetables starting with the ones that need more time to cook. A typical combination of vegetables were bell peppers, carrots, brussels sprouts, broccoli, zucchini, fresh tomatoes and mushrooms. The last two are essential, as they make the sauce very juicy. 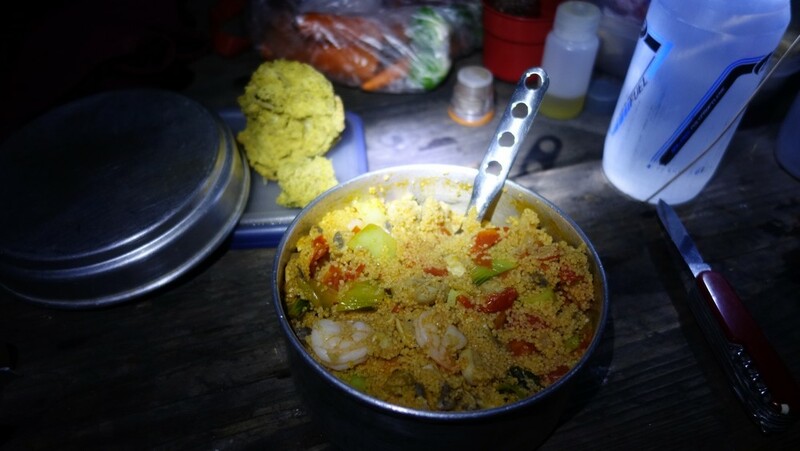 When the vegetables were ready, I would turn the heat off, add enough couscous to soak all the juices and cover it for a few minutes before eating. If there was any space left in the pot and I was rather hungry, I would add some tuna in the mix. Actually last time I added some shrimps. And of course don’t forget the cheese. Since a very miserable night without food in my previous trip, I learned to always carry some emergency food. 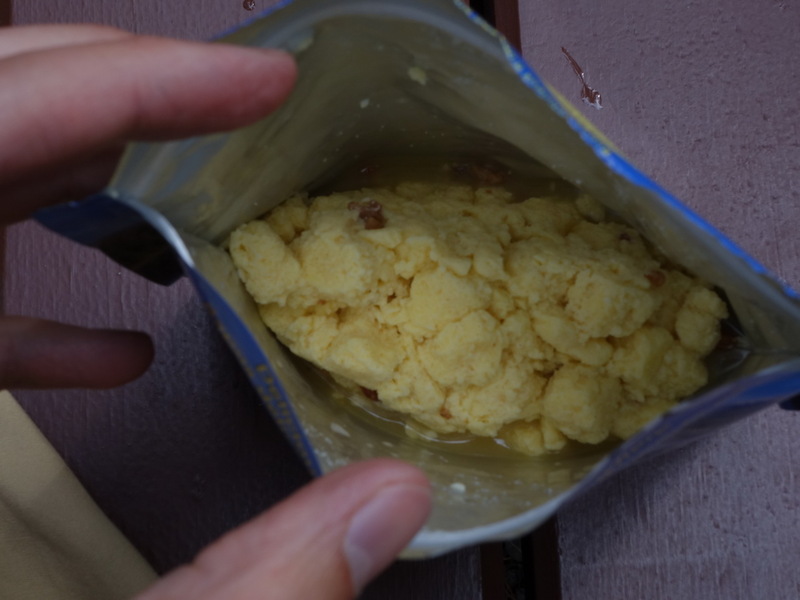 On this trip I was introduced to freeze dried food. All it needs is a hot water, a stir and 10 to soak. 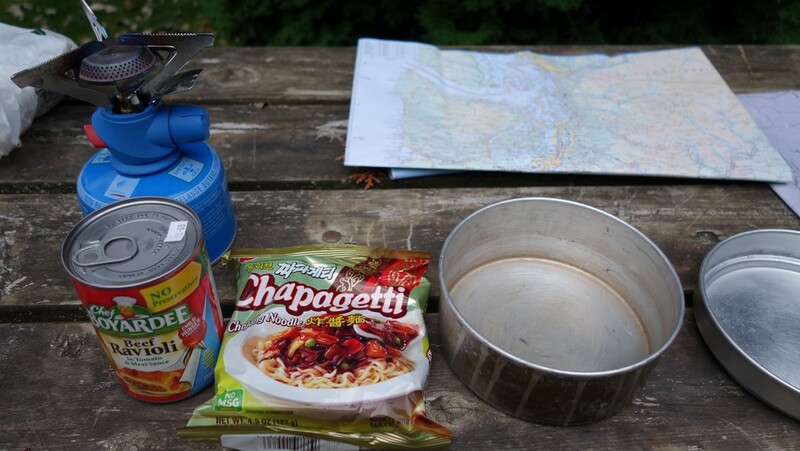 It came handy a couple of times that I didn’t manage to find grocery stores on the way, as well as a couple of times that I wasn’t feeling like cooking. Even though the idea feels wrong, they are very light and easy to carry, very convenient to prepare, as you can eat them straight out of their own sack and most of all they taste amazing. Some of the recipes I tried was beef stew, chicken terriyaki, pasta primavera and omelet with peppers. Depending the wildlife of the area, make sure you store your food properly. 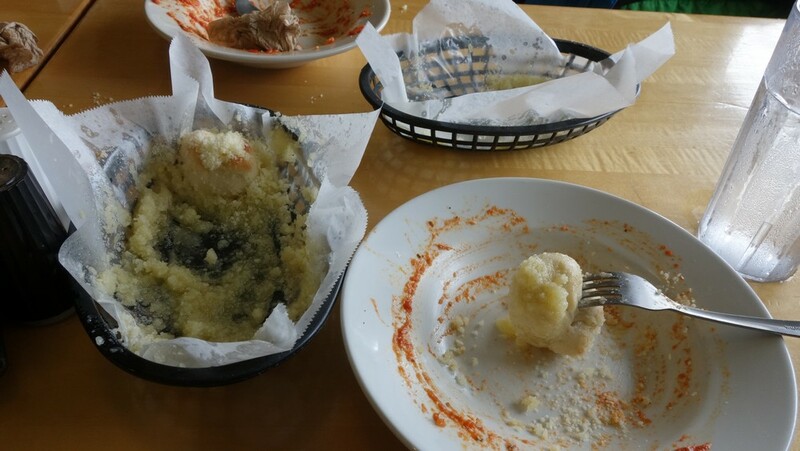 This entry was posted in Post Arrival and tagged food on 14/11/2013 by Georgios.